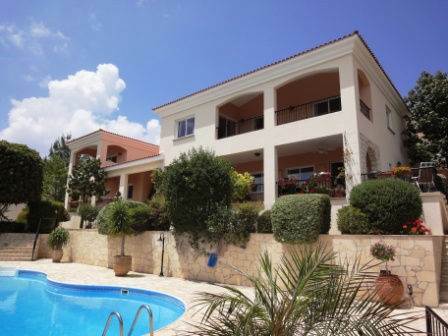 Peyia, Paphos - This 5 bedroom family home sits on a secluded spot in the hills of Peyia, with stunning sea and mountain views. The property has been superbly maintained by the current owners, and is in tip top condition, with many of the original finishes having been replaced. The house is a labyrinth of rooms waiting to be discovered, and is ideal for family life where every individual can be accommodated. All the rooms are spacious with every comfort in mind. The upper level features an entrance hall with master suite to the right and guest accommodation to the left. The master suite consists of a large bedroom with private covered balcony, a dressing area with lots of cupboard and storage space, a large bathroom and kitchenette. The guest accommodation with hallway has 3 very large bedrooms (one with en-suite), and a family size bathroom. All 3 rooms have direct access to a covered balcony via patio doors. An impressive wide spiral staircase leads down to the living room with feature fireplace and corner fitted bar. Behind this is a smaller cosy snug which is used as a TV room. On the far side of the lounge is access to a guest cloakroom, snooker room, office, and private terrace. A hallway leads to a formal dining room and through to a stunning kitchen with central island, guest cloakroom, and utility room. Here there is also maid’s quarters with en-suite shower room which can be accessed directly from the double garage. With a large workshop/storage room adjacent, this accommodation could easily be extended to include a fitted kitchen. Off the kitchen is a wonderful covered terrace with a feature stone arch, and steps leads down from here to the private swimming pool area with corner built-in barbecue. The landscaped gardens are absolutely superb, and the plot having it’s own bore hole, makes the cost of irrigation iincidental. A pathway with waterfall feature at the side leads to the full size tennis court.